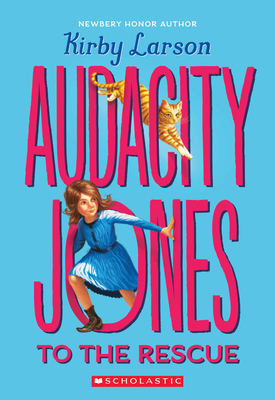 Audacity Jones pines for adventure, something to break up the monotony of her days at Miss Maisie's School for Wayward Girls. Being a Wayward Girl isn't so awful -- even if Audie is condemned to the Punishment Room almost daily. Audie has the dearest of friends at the School, as well as a terribly clever feline companion named Miniver and plenty of books to read there. Still, she longs for an escapade to rival those of the characters in the swashbuckling novels she so adores. But when the mysterious Commodore Crutchfield visits the school and whisks Audie off to Washington, DC, she knows she's in for the journey of a lifetime. Soon, though, it becomes clear that someone has unsavory plans for Audie -- plans that involve the President of the United States and a very sinister plot. Can Audie save the day before it's too late? From Newbery Honor author Kirby Larson comes a rollicking adventure starring a plucky and charming orphan readers won't soon forget. Kirby Larson is the acclaimed author of the 2007 Newbery Honor book Hattie Big Sky; its sequel, Hattie Ever After; The Friendship Doll; Dear America: The Fences Between Us; Duke; Scott O'Dell Award for Historical Fiction winner Dash; Liberty; Audacity Jones to the Rescue; and its sequel Audacity Jones Steals the Show. She has also co-written the award-winning picture books Two Bobbies: A True Story of Hurricane Katrina, Friendship, and Survival and Nubs: The True Story of a Mutt, a Marine, and a Miracle. She lives in Washington with her husband and Winston the Wonder Dog.